RedBottle Design is introducing one of their newest apps for Google Glass and other Android platforms, called GlassPay, at the DEMO 2013 Conference, happening in Silicon Valley. But what has that got to do with Bitcoin? Well, this app replicates the online buying experience in brick-and-mortar stores, making purchases safe and simple in establishments that already accept Bitcoin. GlassPay will allow both shoppers and merchants to enjoy easy and quick sales transactions. When buying something, Google Glass and Android users simply have to scan UPC codes, assemble a “shopping cart”, make the purchase using Bitcoins and pick up the products in a centralized location. “With GlassPay, we’re taking one of the most basic cultural experiences, the act of purchasing items, and bringing it into the future”, said Guy Paddock, CEO of RedBottle Design, in a press release. “Bitcoins are gaining significant acceptance in the worldwide marketplace and we know that face-to-face, app-based shopping and purchasing is in the next wave. We’re ready for it”, he added. There are a lot of benefits for the customer, according to RedBottle Design. 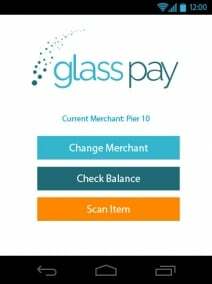 “With GlassPay, users simply bring their Android smartphone or wear their Google Glass device into a store, scan items and make purchases right from where they stand. There’s no need to carry a wallet or wait in line“, the press release explains. Besides, with GlassPay, a customer’s virtual Bitcoin wallet is controlled by a password and the cryptocurrency can be sent only by the customer. “Unlike cash, Bitcoins are difficult to lose, steal, or misplace. And unlike credit card information, with Bitcoins a seller has no sensitive information on file that can be compromised”. But there are also advantages for the merchants: GlassPay makes it easier to accept Bitcoin as payment and this means higher margins and lower costs of doing business. It’s great for the small businesses, which can now serve more customers, more quickly, and for the big stores, which can conserve precious retail space by keeping inventory in a central warehouse instead of on the sales floor. The app is still being tested, but RedBottle Design expects to get it in the market in the second quarter of 2014, after Google Glass becomes publicly available. For now, the sellers who are interested in using the GlassPay platform should contact the company through their website or phone number (1-855-444-2675).